AUSTIN (KXAN) - Just months after lawmakers and teachers came to a fix for the Teacher Retirement System health care insurance plan, now it could be the pensions coming up short of money. The Teacher Retirement System -- TRS -- pension plan is funded by investments, contributions from teachers and state funding. When one goes down, the others have to pay up to keep current benefits. And the TRS actuary told the Senate State Affairs Committee Wednesday that investments in the coming decade are not going to be as good as previously expected. In short, to make the system legal under the Texas constitution, TRS needs $400 to $800 million more dollars a year. Another funding problem? Christie Smith has been a teacher her entire career. She teaches kindergarten at Rowe Lane Elementary School in Pflugerville and hopes to retire in the next five years. "You know in the classroom it's going to be really hard at 60 or 65 chasing around kindergartners," said Smith. She says all her retirement income will come from her teacher pension. "Texas is dead last when it comes to non-salary compensation amongst all 50 states and it's not real close that we're dead last," said Monty Exter from the Association of Texas Professional Educators. He says Texas has been doing the bare minimum for decades and when you do the bare minimum, small problems become big problems. "I was looking on my Facebook timeline the other day and it pops up in my history. Wow. This is from four years ago. This is from five years ago. This is still a problem and still an issue," said Smith. Smith hopes both the teachers and the state can find the money together but that remains to be seen in next year. Looking into long term fixes for the Teacher Retirement System is an interim charge from Lt. Gov. Dan Patrick. Vice Chair of the State Affairs Committee, Texas Sen. Brian Hughes, heard from TRS Wednesday at the committee hearing and is confident the state and teachers can work it out. "It's going to have a few changes to make sure it stays sound. But overall it's actuarily sound. The money is really there unlike social security which is sadly full of IOUs," said Sen. Hughes, R-Tyler. Lawmakers return to the capitol next January when they face a tough budget year already. Details on any fix are not yet available. Teachers and lawmakers just had to do the same kind of wrangling in 2017. TRS Care - their health coverage had a projected a $1 billion shortfall. So lawmakers added $700 million in funding to support the program. They also required teachers to pay more in the form of higher premiums and co-pays. Those changes went into effect in January of this year. 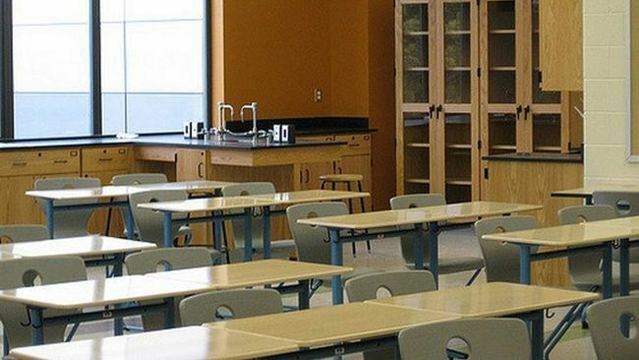 Teachers in Oklahoma are still calling for more awareness about their classroom spending. They are walking from Tulsa to the Oklahoma State Capitol, 1110 miles. The seven-day march began Wednesday, the third day of statewide teacher walkouts. They are hoping lawmakers will increase funding for education. To save money, Oklahoma schools went down to four school days a week. AUSTIN (KXAN) – Just months after lawmakers and teachers came to a fix for the Teacher Retirement System health care insurance plan, now it could be the pensions coming up short of money. The Teacher Retirement System — TRS — pension plan is funded by investments, contributions from teachers and state funding. When one goes down, the others have to pay up to keep current benefits. And the TRS actuary told the Senate State Affairs Committee Wednesday that investments in the coming decade are not going to be as good as previously expected. In short, to make the system legal under the Texas constitution, TRS needs $400 to $800 million more dollars a year. Christie Smith has been a teacher her entire career. She teaches kindergarten at Rowe Lane Elementary School in Pflugerville and hopes to retire in the next five years. “You know in the classroom it’s going to be really hard at 60 or 65 chasing around kindergartners,” said Smith. She says all her retirement income will come from her teacher pension. “Texas is dead last when it comes to non-salary compensation amongst all 50 states and it’s not real close that we’re dead last,” said Monty Exter from the Association of Texas Professional Educators. He says Texas has been doing the bare minimum for decades and when you do the bare minimum, small problems become big problems. “I was looking on my Facebook timeline the other day and it pops up in my history. Wow. This is from four years ago. This is from five years ago. This is still a problem and still an issue,” said Smith. Smith hopes both the teachers and the state can find the money together but that remains to be seen in next year. Looking into long term fixes for the Teacher Retirement System is an interim charge from Lt. Gov. Dan Patrick. Vice Chair of the State Affairs Committee, Texas Sen. Brian Hughes, heard from TRS Wednesday at the committee hearing and is confident the state and teachers can work it out. “It’s going to have a few changes to make sure it stays sound. But overall it’s actuarily sound. The money is really there unlike social security which is sadly full of IOUs,” said Sen. Hughes, R-Tyler. Lawmakers return to the capitol next January when they face a tough budget year already. Details on any fix are not yet available. Teachers and lawmakers just had to do the same kind of wrangling in 2017. TRS Care – their health coverage had a projected a $1 billion shortfall. So lawmakers added $700 million in funding to support the program. They also required teachers to pay more in the form of higher premiums and co-pays. Those changes went into effect in January of this year.